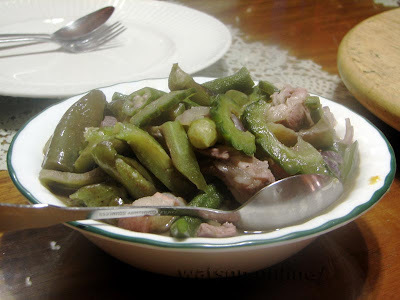 Dinengdeng is an Ilocano veggie dish similar to the Pinakbet. The more prominent difference is that Dinengdeng tends to have lesser vegetable items in it, and it uses fish sauce (bagoong), while pinakbet uses shrimp paste (alamang). My older sister Cathy once invited us over for lunch and it was my good fortune that preparations for the meal was just starting when we arrived. Yep, I think we arrived a bit too early (were we obviously eager for the lunch? hahaha! ), so we made ourselves useful by helping out with the chopping while they were amused with my taking photos of the procedure. 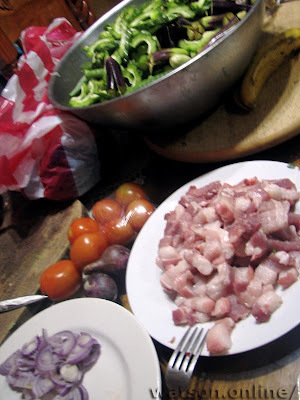 This particular version - which is popular with the locals in Baguio - uses only three types of veggies. 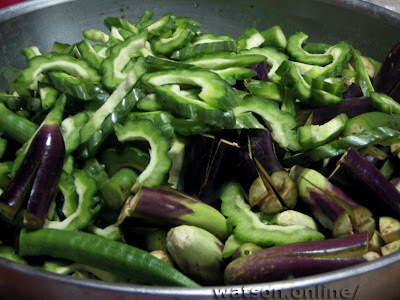 In our case, we used eggplant, bitter gourd (ampalaya), and okra. Kalabasa (squash) and Sitaw (string beans) are also popular choices so these can be used in place of the other veggies; just stick to three kinds. As for the quantities of each, my sister advised me to just approximate it. If you want more okra, that's fine. It never fails to amaze me how my sister and mother is able to cook wonderful meals by approximating. In a cooking pot, place the chopped pork at the bottom. Next, pile the chopped vegetables into the pot. Next comes the onions and tomates. In a heated frying pan, pour cooking oil and toss the garlic until golden-brown. Then pour the bagoong and saute it. The aroma wafting through the kitchen will inform your next-door neighbor what your viand is! Pour the bagoong into the cooking pot, cover, and bring to heat. The cooking veggies will give water to the dish. 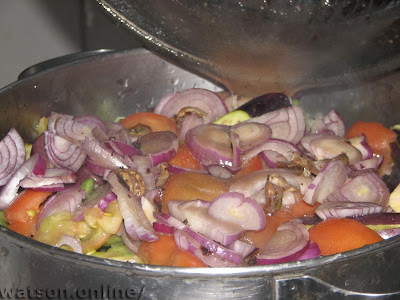 When the veggies are half-cooked, give the entire cooking pot a good shaking. 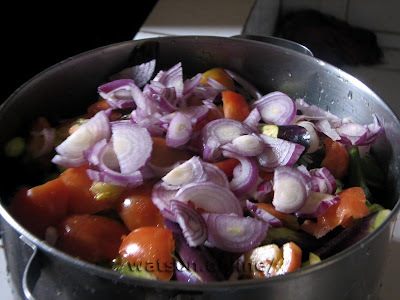 Do not use a sandok (ladle) to mix the veggies as this will turn the dish into pulp. Remove from heat when veggies are done. Dinengdeng is meant to be served with hot, steaming rice. Also best with a fried dish (such as fish). In our case, we had crunchy, yummy fried lumpia. My stomach is grumbling just by recalling the aroma of the dinengdeng and the sound of the lumpia dipped in sweet ketchup! Yehey!! may food blog ka na :D I always love your food commentaries kahit hindi ikaw nagluluto. hehe! Sarap ng dinengdeng! You just made me want some. JMom! Thanks for visiting my food blog! Link ko dito food blog mo ha! I love this blog. 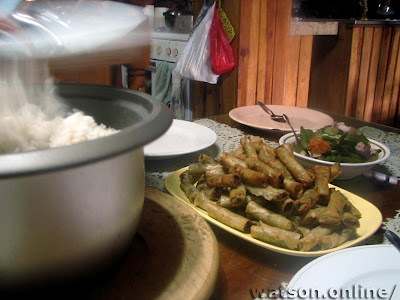 I love the photos of Filipino food recipes...really turn on my appetite and craving for delicious Filipino food. Great post!